We are always and deeply grateful for all of the help we get from our volunteers and sponsors. It is rewarding to see how well used and loved our trails are, and also to hear directly about the myriad of experiences people have in the park - Especially from those just discovering it. On that note, this spring our all-volunteer Mount Vernon Parks Foundation launched a new program it developed for bringing Mount Vernon School District fifth grade classrooms to Little Mountain Park. 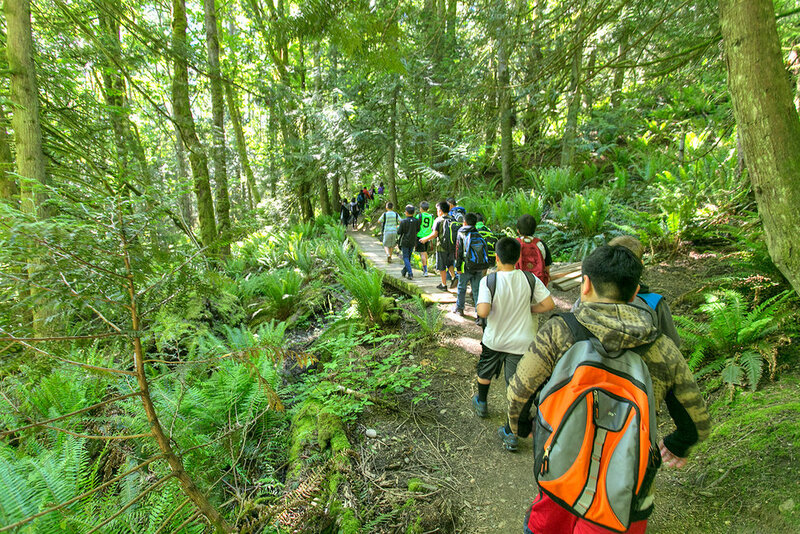 The intent of the field trips were to link the students’ experiences at the North Cascades Institute's Mountain School in North Cascades National Park to environments much closer to home. The Foundation’s own educator members even created a special “Hiking on Little Mountain” guidebook with learning activities focused on subjects like geology, biology, physical education, and language arts. Working from their "Little Mountain School" guide books, students use an old-growth cedar stump to learn about measuring trees. Over the past few weeks, nearly 400 total fifth-graders participated in the five separate hiking field trips, including 85 from Centennial Elementary who made the trek from the East Entrance all the way to the top of the mountain, where they were able to spot their neighborhoods as well as prominent landforms and waterways they had previously studied in class from either the North or South Viewpoint. In addition to geography and hydrology, they also monitored their own physiology- stopping to check their heart rate and pedometers at strategic intervals. Centennial Elementary students pausing to check their pulse during their 5-mile hike. 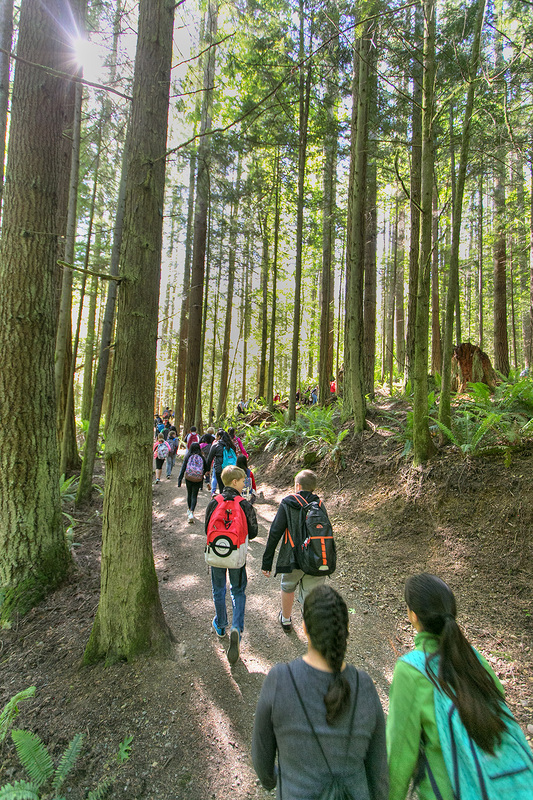 Special thanks to sponsorship support from Mount Vernon Public Schools Foundation and Skagit Regional Health for helping make these field trips possible. Thanks also to some of our own Little Mountain Trail Builders and Mount Vernon Parks Foundation board members for volunteering to guide these groups up and down Little Mountain. The Little Mountain School program is only possible through private donations & sponsorships.